"Here's a heart-healthy and delicious soup that's easy to customize. Just add or delete ingredients to suit you own tastes. " Bring a large pot of salted water to a boil. Stir in the pasta, and return to a boil. Boil, stirring occasionally, until cooked through but still firm to the bite, about 12-15 minutes. Drain well. Heat olive oil in a large soup pot; add turkey, onion, and garlic. Cook over medium heat until meat browns and onion is soft, about 5 minutes. Stir in sage and rosemary and cook for about 1 minute, do not allow herbs to brown. Pour the broth and water into the pot along with the garbanzo beans and tomato paste. Bring to a boil and add kale. Simmer until kale softens, about 5 minutes. Season soup with salt and pepper. 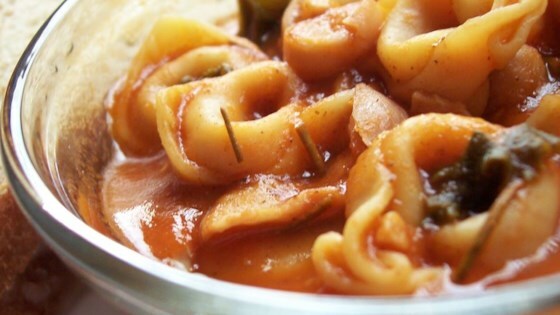 To serve, place a serving of cooked pasta in the bottom of a soup bowl and ladle hot soup over. Dried herbs can be substituted for the fresh, just use half as much. Don't understand why my experience was so far short of the rave reviews this recipe got. I am pretty good at following a recipe. I give it three stars based on good healthy ingredients. Delicious, esp. with the fresh herbs. Instead of the pasta I added cooked quinoa for a little extra protein and whole grain nutrition - excellent. This soup is delicious! The fresh herbs and kale make the soup really stand out from others. I would not change a thing! This was very good and easy to make. The one thing I will change is to make only 6 to 8 ounces of pasta; 16 ounces of pasta is WAAAY too much for this recipe!